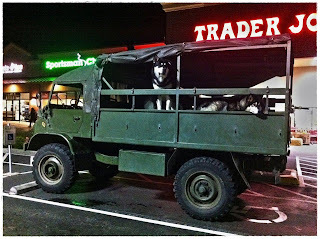 I was shopping at a Trader Joe's in Bellingham Washington and noticed the oddest looking truck (an old military looking Mercedes flatbed truck ) with the most striking husky dogs sitting in the back. I didn't realize how big these dogs were, especially their heads! They were so passive and very friendly with everyone that stopped by to pet them, which was everyone who passed by! It was difficult to get a clean shot of the truck and the dogs without people surrounding them. 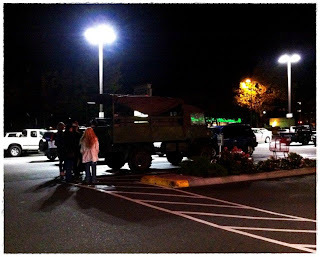 In fact, when the owner got back to his truck, he had a crowd of people (actually, all women) wanting to talk to him about the dogs. I was trying to talk with him, but about his truck!! Oh well. 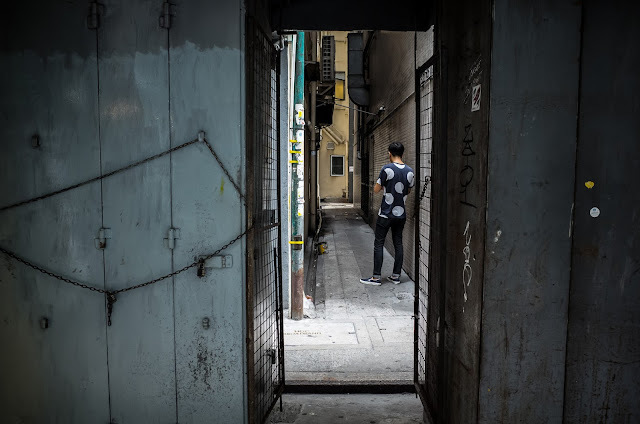 If he had to choose between a group of women or one guy, I know what his choice would have been anyway. These pictures show the inherent weakness of an iPhone camera (super grainy and fuzzy in low light) but at least I had a camera on me. Thank goodness for my iPhone. Thank you Steve Jobs.